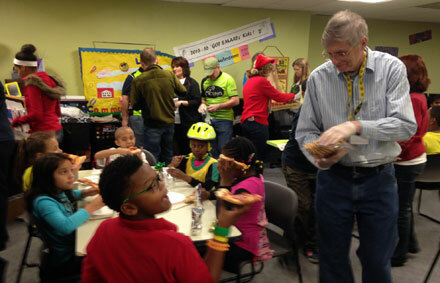 In its first year, the Grayson Cycling Club has managed to give back to the community in a way that far exceeds their very first expectations. 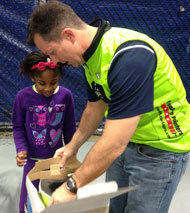 With simple goals involving fitness, community, fellowship and altruism, the GCC has gathered enough sponsorships to provide 35 bikes and helmets to Lawrenceville Boys and Girls Club students who have excelled in academics. 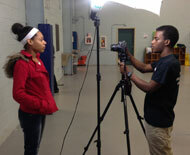 Left: Lawrenceville Boys and Girls Club Youth of the Year, Brian Ball interviewing Jasmin Moffett for a future video production. With that, Mr. Johnson began calling the names of the students who had maintained straight A’s all semester. 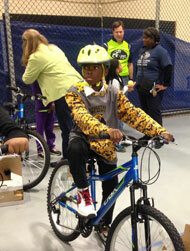 As the kids came up, a member of the Grayson Cycling Club greeted them and “introduced” them to their new bike. Seats were adjusted and helmet safety lessons were given. 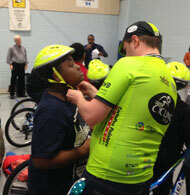 Above and right: GCC members help students fit their helmets and adjust seats to get just the right fit. 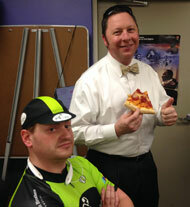 Left: Pizza Party! 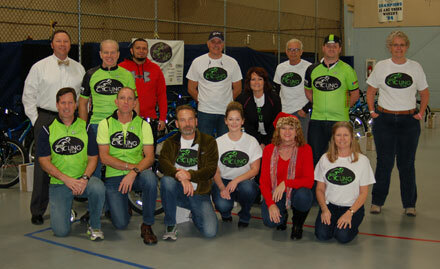 Right: Exececutive Dir., Rory Johnson and other members are so happy to give! 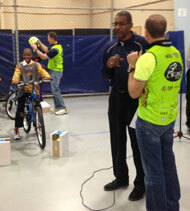 The most senior recipient of a bike was Central Gwinnett student, Jasmin Moffett. “I have a 3.94 GPA,” says Jasmin. “I plan to attend Kennesaw State and major in education.” Last summer, Jasmin worked at the Boys and Girls Club in Lawrenceville as a Junior Counselor. She and Brian Ball, the Boys and Girls Club Youth of the Year, helped organize the kids for photos and video clips of the event. Brian plans to use the clips in a video about the bike awards. 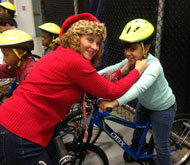 Following a group instruction by GCC’s John Coyle on helmet safety, the kids unanimously promised to practice safety when biking. Then, they made a bee-line for a pizza party while calling out huge thank you’s with some stopping for hugs. 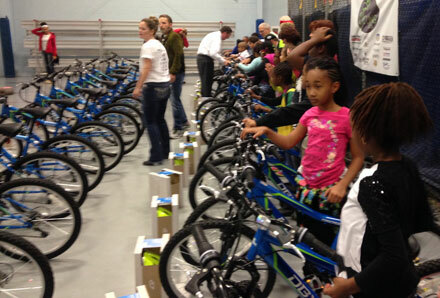 Below: Sayda and Madison of the Lawrenceville Boys and Girls Club talk about their new bikes as they wait patiently for their helmets.